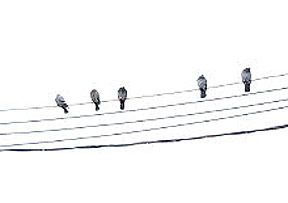 I must be feeling better because I am noticing little things again, like a few pigeons on a wire. Also, bare tree branches against the darkening afternoon sky, snow drifts, colors, flavors - things I missed in the last few sniffly weeks! This past Saturday, Paul and I made a pilgrimage to an untapped Value Village way out in the north west part of the city. I found these cool fabrics for $2 and $3 and 4 balls of blue Patons cotton wool for $2. So it was more or less worth feeling really gloomy waiting for the bus home on a desolate windswept corner. Getting home was great though and I spent the rest of that afternoon reading a cheesy novel and drinking tea. Bliss! Last night I printed up these cards. I love spots. I had originally thought I would use it as a background with something cute on top, but I like it alone. It might be nice repeated on fabric. I am a 70s bed sheet junkie and totally share in your glee over those excellent finds. I have a stack of beauties that I keep meaning to do "something with". Maybe we can swap ideas! Hope your having a good day tania! :) p.s. very photogenic kitty! did you get kitty at Value Village too? i love that cat! the stripes & floral really suit her/him. it is the asian influence, you know. 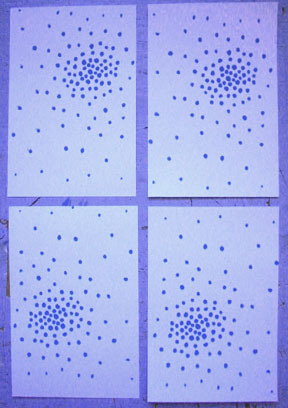 you might like this artist's work: >http://staceyvetter.com< lots of circles! i enjoy your blog very much. thank you. Your kitty is so gorgeous! What a beautiful kitty, and the spot cards match her eyes exactly! Great finds. t- nice to see you are well into spring craftiness! which VV are you referring to? have you ever ventured out to the one North by York? also, click on my URL, there is a snowship from Dupont that you might like! I'm glad to know you're feeling better :) I hate being sick! 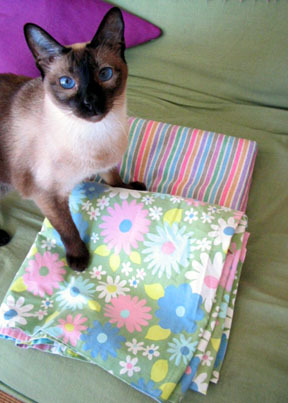 Beautiful everything - fabric, cat, card, and picture! thats funny, i just clicked on your site and saw the crazy ship and now you left a comment! it was the VV at keele and lawrence. FAR! Glad you're feeling better and can take in the wonders of the world again! Your kitty is so cuddly cute. And great finds!! glad to hear you are feeling better and more inspired about life! will most definitely give your namen to the art director for illustrations, they pay quite nicely!